Evangelism & Discipleship: Evangelism & Discipleship is based on the Great Commission set forth in Matthew 28:16-20. The Lord Jesus Christ who had been given all authority in heaven and on earth commissioned his disciples to go and make disciples, baptize and teach them to observe all of his commandments. Missiology: Missiology is the study of foreign missions. When Jesus commissioned his disciples to go make disciples, baptize and teach them to observe all of his commandments he commissioned them to go to all the nations. In Acts 1:8 Jesus told his disciples that they would be his witnesses in Jerusalem (which is where they were when he said this), in all Judea (the country that Jerusalem was in), in Samaria (the closest neighbor to Judea) and even to the remotest part of the earth. These three classes are at the center of my heart and the reason that I started writing this blog. I desire to tell people about the hope that is in me. I desire to make disciples and teach them all that Jesus commanded. I desire to do so wherever the Lord should send me even to the remotest part of the earth. 2 ½ years ago I started into the Master of Theological Studies program because the Great Commission had been put on my heart and just like the disciples of Jesus Christ were discipled by him for three years before he commissioned them, I desired to be discipled. My mind has been changed a great deal by all that I have read and the things that I have heard while going through this program. I see the Great Commission in a much different light than I did before. I am looking forward to starting these final three courses and I am looking forward to what the Lord will have me doing after completion. Not my will but let the Lord’s will be done. 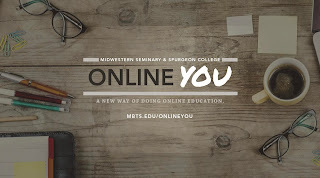 Online You: Online Education for the Church from Midwestern Seminary.